Here's another piece I recently did in trade for a Spookytown pin-up. It's for my friend and fellow comic book creator Mark Murphy. 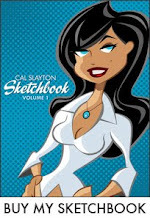 It's a character from his book Tiki Joe Mysteries. If you haven't checked out this book, you should. I mean seriously, I told you to a year and a half ago! What are you waiting for? Buy it already. This was fun piece to work on. 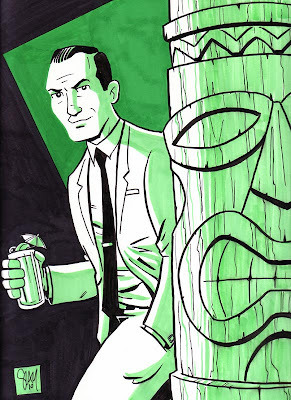 I love Tiki stuff. There is actually a scene in Spookytown that takes place in Tiki bar. I'm looking forward to drawing those pages. Anyway, this piece came together really quickly for me. A lot of times I labor over poses and layouts, but this one popped in my head, I doodled a thumbnail on a Post-it note and I was on my way. I wanted a retro feel, so I went monochromatic with the color scheme. It's done with pen and markers. Hope he digs it.